29 Can you get on Skype? 38 Change the Tips and Details of Nova Imperator's passive "Master of Warfare"
Hey do you have Skype? I'd like to talk to you over that instead of constant topics. Hey, are you trying to rework the tabs? If so, are you done yet? It's broken on a lot of pages. Hey this is Kenny. I have rollbacked Tabs to original version for now. The new one causes a huge spike in response time for some reason, I'm not sure why. When I changed back to the old tab, the response time instantly decreased. When you're looking at different Skins, does the tabs display as if there is no border but only the main structure? This is because the tabs's main structure is written in all skins, but the Vector Skin make it finer with borders and something else (color settings, border setting, radius borders, and paddings, and more detailed settings are going with Vector). As you request, I am going to temporarily copy the Vector setting to other skins. And later, I will try to make tabs look different in different skins. My pleasure. That's because the tab spacing color and borders are stated in the skin, and the common skin (for all skins) only define the tab structure. Network down. Can not login QQ. I am in the computer lab and there's no way to install programs. Talk here for what you want to say. I went through all of the deleted pages. All the ones that have information that still applies in the current game has been restored. Also, all the costume pages that are made by User:G123u and User:RefrainZero have been restored. I also restored the Template:ItemRef because some people use it to obtain image icons. All the ones that are truly old remain deleted. This template doesn't work anymore (speed, range and difficulty) since I've updated it this morning. It doesn't show the colours and I don't know how to make them appear again. I updated this template this morning but it added gradient color so is it possible to remove the gradient ? You know, I have lots of things to change, so the first one will be changed later (I am now working with Infoboxes). And I have remove the gradient as you request for the second one. For second one, I think it is not a problem. The gradient is fancier and is compatible in all browsers (If do not support gradient, it will be true color). 1) First, I would like to thank you for fixing the wikiskin Monobook's issue with the sidebar but now there's a new problem with it. The main page is overlapping with the sidebar and blocking the links. 2) The Languages template seems to be missing its background and borders. The (2) languages missing background and borders because I removed them and added to wikiskins. The (1) sidebar will be fixed soon if I can figure out a solution. 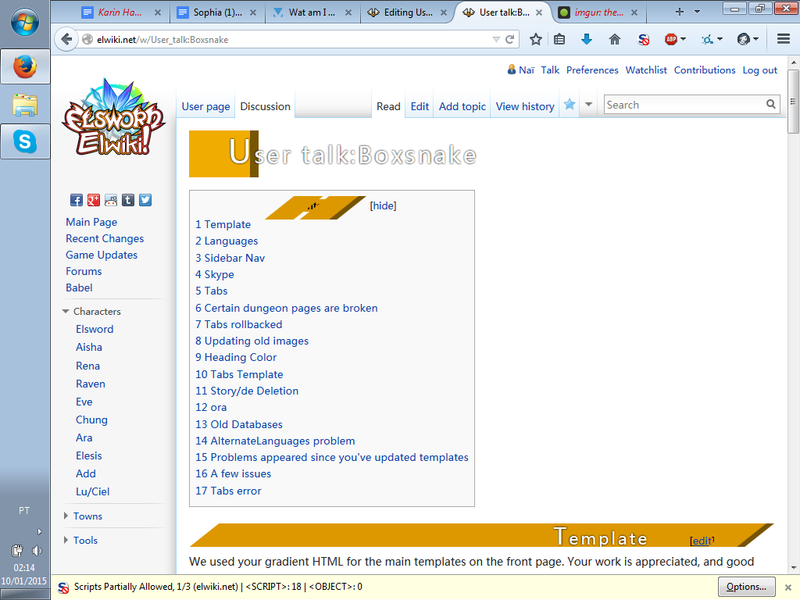 Whatever core level change happened seems to have affected Template:Doc as well, since the error Rokujou reported yesterday on the Language template also happens on the Tabs template page. I am still trying to figure it out, because the title of toc is a "h2" level, thus it uses the h2 styles of content pages. Will be fixed soon. For the tabs, it is not bug if it goes to the left. 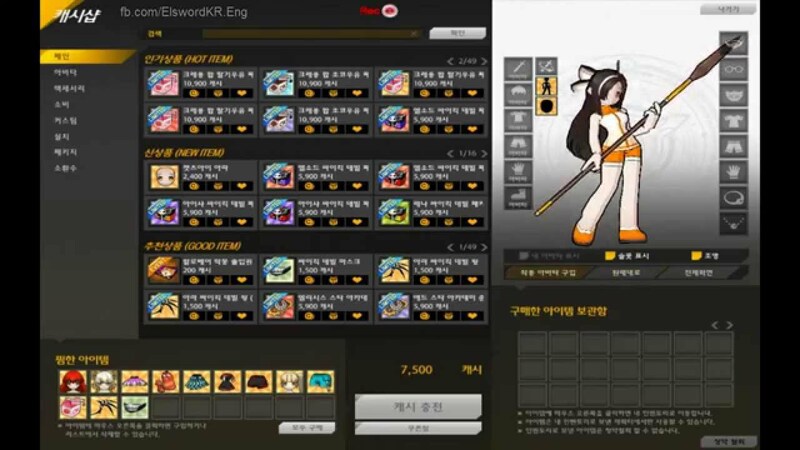 I am planning to make it like cash shop UI in KR server. Did you recently do something with the tabs again? It isn't working again. Something went wrong, futher changes should be done to figure it out. Have the same problem. Since the 30 January were my tabs broken. Firefox restart, cleaning cache, and cleaning other things doesn't work. Yesterday I updated the firefox from 35.0.1 to 36 and it was working again. did u do something to the tabs? i doesnt work for me now. But if you check out http://elwiki.net/w/Titles/de it crashes. Did you make any recent changes? But if you check out Titles/de it crashes. Did you make any recent changes? Is it possible to locally store this file on elwiki? I've noticed it's taking a long time to load. Can you get on Skype? Spatial Pull is (ZZXX) and vice versa, Spatial Warp is (>>^XZZ). Do we have images of the icons of the Google Play Store and the iOS Apple Store? If not do you think I can upload them or would that bring up copyright problems? I need these text replacements for the german skill pages. You may have to go into the code to see them correctly. Again, I wanted to ask you if you could do some text replacements for me. Normally, I'd wait until I have more 'to-do-text-replacements' and at this point, an idea came to my mind regarding the topic Text-Replacements. Similar to the 'Category:Candidates_for_deletion', I think it would be useful to have a category-site for text-replacements (like 'Candidates_for_text-replacements'). If we had something like that, other users and I could write our candidates for text-replacements down there and we won't have to write long messages for every tiny text-replacement that we need. Do you think that could be something to think about? Hi, just wondering what the reason is for the change in font? Some people are complaining it's harder to read. Sorry for inconvenience. I was just trying some better typography but didn't expect the worse effect. Hi, is it possible to fix this? The only way i can go around this is saving the page again but it will go back to borderless after awhile. Hi, I was trying to edit Code: Sariel's main page and I couldn't since it is blocked (adm only). I'd like to add some trivia and tips about her, like the origin of her class name and other stuff. Change the Tips and Details of Nova Imperator's passive "Master of Warfare"
This page was last modified on 7 January 2019, at 05:35.